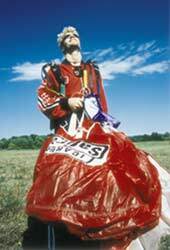 In 1998 we released the Icarus Safire. A revolutionary canopy, being the first all purpose 9 cell canopy to include a lightly & truly elliptical planform shape offering superior openings and flight characteristics compared to competing mid-performance 9 cell designs at the time. We knew that the superior characteristics of this design (such as a lightly elliptical planform shape, and constant cell proportioning) would not be ignored by other canopy manufacturers. This style of design would become the benchmark for mid-range performance canopies and other manufacturers would build similar designs. The Safire 2 goes one step ahead of the competition again. Like the original Safire it is a truly elliptical canopy with a light shaping incorporating a constant cell aspect ratio which consistently controls the airfoil shape across the canopy, maintaining increased rigidity and reducing drag. The Safire 2 is an enhanced version integrating new trim and plan form shaping techniques offering an increased glide ratio, more responsive flight controls both on toggles and risers, a more powerful flare and a shorter recovery arc making the canopy even more predictable. Its openings are arguably the sweetest of any canopy in its class. So much so that you'd swear it was a 7 cell opening above your head. The Safire2 has been designed as an all-round, no hassle mid-range canopy offering the benefits of a 9 cell performance but without getting radical or requiring any special attention. 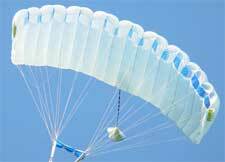 It's easy to use with no hassle consistent openings, easy packing and great landings. This makes the Safire's performance suitable for a wide range of uses. It is suitable for a first canopy when lightly loaded or can be a modern mid-range performing wing at heavier wing-loadings. The result - An impressively balanced all-round wing offering superior opening qualities, exceptional glide and range, outstanding slow flight stability and superior safety. For those who want the latest that technology has to offer, but cant be bothered dealing with the issues normally associated with elliptical, or don't wish to jump outdated designs with limited performance, then the Icarus Safire is the perfect choice. As with all our canopies the Safire is available in any size you choose. 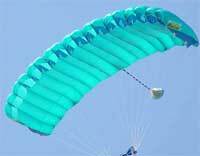 We recommend it for wing loadings from .75 PSF to 1.6 PSF. Standard sizes: 99, 109, 119, 129, 139, 149, 169, 189, 209, 229. Backed by Icarus Canopies 'EXCLUSIVE' 31 Day Satisfaction Guarantee.